HOW DO YOU SOLVE A PROBLEM LIKE AN E.T.? In my last blog post I looked at some of the reasons it’s not surprising that we haven’t yet discovered signs of life elsewhere in the universe. Life signs are hard to unequivocally identify as such, because other things might be the cause. Alien species might be so different that we can’t recognize the energy signatures or communication transmissions their societies produce. 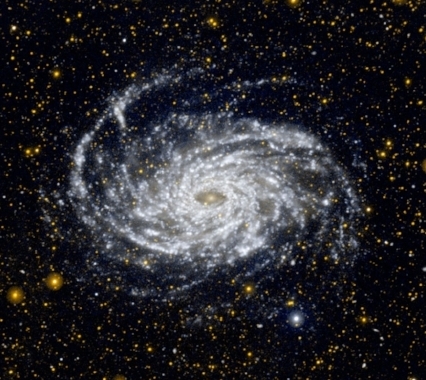 And space is so incredibly vast that our search efforts have covered only a miniscule portion of even our own galaxy. But let’s say we ultimately succeed. What will we do if we encounter life on other planets and in other solar systems? Will we protect it? Exploit it? Or destroy it out of fear of contamination, or simply because it’s in our way? The questions get even bigger when it comes to advanced, sentient life forms. Will we look at them as friends or enemies, benefactors or threats? It’s much too facile to say that it will depend on how they treat us. We should know ourselves well enough to understand that what we bring to a relationship, on whatever scale, is what we’ll probably take from it. When Europeans arrived in North America, some looked for harmonious cooperation with the indigenous peoples and got along well with them (though their arrival still wasn’t good news for the original inhabitants). Others sought to conquer and subjugate, and immediately made enemies. And that was among fellow humans. Concepts like friendship, kinship, cooperation, loyalty, duty, authority, and many other critical social dynamics may have no equivalent at all in an alien culture, or radically different applications and priorities. We can’t know ahead of time, so does that mean we shouldn’t prepare at all? No, that would be foolish. Even though alien mindsets are by definition hard to predict, we have to try. Even more importantly, we need to be clear about our own motivations, and establish strong rules about how we will behave regarding alien life at all levels of development. Just as the Outer Space Treaty of 1967 forms the basis of how we deal with local space bodies, we need similar laws to be established governing our interactions with alien life forms. We need this before we make such a discovery. It’s no good locking the barn door after the horse is gone. Whether the aliens we discover are benevolent, malevolent, or ambivalent, our relationship with them will get off to a better start if we can demonstrate that our species abides by strict laws that ensure we’re not reckless aggressors or exploiters ourselves, and that we’ve built a good foundation toward understanding and cooperating with others. Where would we begin to formulate possible responses to extraterrestrial life forms, in all their potential variety? Laugh if you like, but I think a great start would be to gather all of the human/alien encounter stories in science fiction and evaluate the interactions described in them! Who has given more thought to such scenarios than us? It would be a large task, I admit, but so is scanning 33,000 light years of space. Speaking of which, although SF stories over the decades have gradually prepared our minds to accept the idea of alien species, those depictions haven’t all been positive, to say the least! Conclusive evidence of a civilized race beyond our planet would panic many people and send shockwaves through our global economy. Even the most optimistic of us won’t be able to totally shrug off movies like Alien or Independence Day. So we have to prepare ourselves and our society for that reaction—if we can’t, then we shouldn’t be in such a hurry to draw attention to ourselves. For the past century, we’ve been spewing radio and TV signals out into the cosmos like a giant locator beacon. Even worse, much of its content would give an observer the impression that we’re unrelentingly warlike and violent. We can’t call those signals back, but maybe it’s past time to find a way to block them from going beyond our atmosphere (although internet-based entertainment sources like Netflix are helping). It might not be possible to ever fully prepare ourselves for First Contact with an alien species. Lets not blindly rush into it! There’s another reason that might explain why we haven’t yet detected signs of civilization elsewhere, and it’s a disturbing one. It’s possible that, once species advance in technical knowledge to the point where they can control planet-changing chemical processes (like human carbon emissions) and hugely destructive energies, they may destroy themselves. If that’s true, and inevitable, or even quite common, the span of time during which their civilization might be detectable from light years away could be quite short. Humans are now capable of annihilating ourselves, but that’s only been true for a century or so. What if most highly-advanced technological societies don’t make it much longer than that? Consider that we’ve only had instrumentation capable of scanning the heavens over multiple wavelengths of light and radio frequencies for a half-century or thereabouts. If there were an advanced civilization radiating lots of energy into space from a solar system fifty light years from Earth, they would have to have been doing so within the past century for us to even know they existed. And only if their radiations were aimed this way, and if we were looking in the right place! What if, when we venture out into interstellar space, we encounter the remains of such extinct cultures? Science fiction is full of such things, from Clarke’s Rama, to Niven’s Ringworld, Pohl’s Gateway technology, to the Stone from Greg Bear’s novel Eon. Scientists (and SF fans) get excited about what we could learn from alien civilizations, dead or alive, that would advance our technological capabilities. If you ask me, there are deeper lessons that are much more important for us to learn. Such as how such cultures interact peacefully with others. And how to survive our own ever-increasing planet-killing powers. We want to know if we’re alone in the universe. Okay. While we’re looking, let’s do everything we can to prepare ourselves for the answer. Sales figures for books show that sales of science fiction and fantasy novels have been on the decline, and especially science fiction. It’s possible that the numbers are misleading because, in fact, genre novels like SFF do well in e-book form and e-book sales aren’t always tracked well. But why any decline at all? Aren’t we living in an age when science fiction is coming true? Maybe that’s the problem. Could it be that some of the wonder has been lost? I’m not pointing any fingers. Scientific knowledge has made great advances since the early days of SF. The effect of all that discovery on the fiction we love is mixed. Good stories sometimes get bogged down in scientific explanation. I suspect the SF readership has become more divided than ever between those who revel in details gleaned from articles in the latest Nature or Annals of Botany or Journal of Neuroscience, and the fans who start yawning when they run into a dense paragraph of technical terminology or math. Then too, there’s no question that the more we know about the universe, the more our imagination must be constrained by the facts. We do call it science fiction, after all. Good luck selling a new story that features beautiful Martian princesses who ride flying yachts (although if you change it to a fictional place and call it fantasy, you’ll have better odds). If your characters get around in a faster-than-light spacecraft, you’ll need a good explanation for why you’re right and Einstein was wrong. I suspect it’s easier to let magic explain everything (and less of a strain on readers who don’t have a PhD in physics). Or maybe it’s that we see so many technological marvels everywhere we turn, we’re getting hard to impress. Our cell phones may not have the range of Captain Kirk’s communicator, but they can do a lot more. Prototype test cars can drive themselves—heck, yours might park itself already. Our fridges will soon be able to keep themselves stocked as nanotechnology and computer networking transform our household products. The space industry is populated by private companies instead of just governments, and almost ready for tourists. Our sources of entertainment are advancing all the time, too. In the 1950’s and ‘60’s Arthur C. Clarke could take us to a lunar city in Earthlight or the moons of Jupiter in 2001: A Space Odyssey and we’d be filled with awe. Ray Bradbury could describe a tourist expedition to the distant past and we would hear the “Sound of Thunder” from dinosaur feet. But now computer graphics have shown us hundreds of movie space scenes in perfect, eye-grabbing detail. There have been four Jurassic Parkmovies and even dinosaur-era time-travel series on TV (remember Terra Nova?) Film-making has changed a lot, too, from the long, slow pan across the mind-boggling starship of Close Encounters of the Third Kind to the quick cuts and frenetic action of the Battlestar Galactica and Star Trekremakes. I was totally captivated when I first explored Rama with Clarke and the Ringworld with Larry Niven. But now you can experience some pretty amazing stuff at Disney World. Does that mean that written SF is in a slump because it’s not possible to wow people anymore? I don’t think so. It should be more fruitful than ever to feature stories on alien planets now that we actually know they exist, and have data on some really strange ones. Space flight will be more accessible to everyone in the not-too-distant future now that private industry is involved. Computer technology is advancing in ways almost no one foresaw, along with miniaturization and robotics. Not to mention genetic engineering and its stunning potential for good and for bad. All of these fields and more should provide fodder for incredible stories with a recognizable basis in current reality. The “wow” factor must be in making the reader immerse themselves in the world of the story, experiencing what the characters do and enjoying the thrill of potent new technology, bizarre worlds, exotic social structures and more without having to go back to university first. After all, even every day life has moments of wonder and awe. How many more await us in the extraordinary realm that lies just beyond our view?